A special treat this time: a lost robot story that nobody has seen for more than a century. 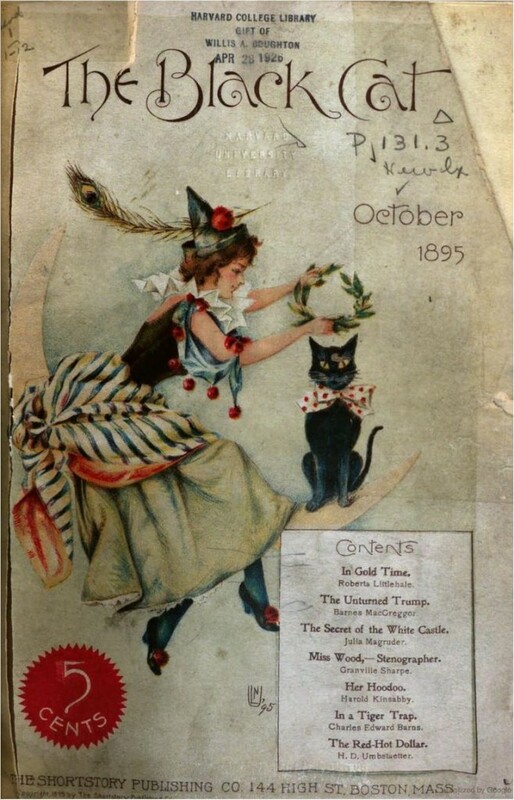 Supernatural tales, ghost stories, odd occurrences, mysterious disappearances, and bizarre inventions all found a home in The Black Cat, a magazine founded in 1895, a year before the first pulp magazine appeared. Mike Ashley calls it “a spiritual ancestor to Weird Tales.” The stories were proto-genre, a mixture of what then got called “unusual” stories, a term that must have had more currency in the 19th century. It was founded by 44-year-old Herman Daniel Umbstaetter, who went by the initials H. D. Not content with being editor and publisher, he seeded the magazine with his own stories, some under pseudonyms, until it took off on its own. Covers were illustrated by his much younger wife Nelly, usually with some variation of the stylized black cat staring spookily out at the reader that appeared from from the first issue. The indispensable Everett F. Bleiler scoured the magazine for his Science Fiction: The Early Years (i. e. before Gernsback) but only found a handful of stories that came close to precursors of science fiction. One such, to give an example, was by H. D. himself, collaborating with Thomas F. Anderson. “The Mystery of the Thirty Million,” April 1896, involves “a Russian inventor who has built a ‘hypnotic cruiser’ furnished with electrical apparatus that can control any ship.” Electricity made anything possible in the late 19th century, just as radioactivity was an all-purpose fallback used Stan Lee to reinvent Marvel in the 1960s, and AI is for the hacks today. Automatons, in all senses robots before the word was coined, were experiencing a fictional revival at the time, with the new-fangled and seemingly miraculous electricity replacing clockwork as their power source. Elizabeth Bellamy’s “Ely’s Automatic Housemaid” in the December 1899 issue is an important early robot story. It was so popular that it spawned a competition, won by W. M. Stannard’s “Mr. Corndropper’s Hired Man” – an unabashed rip-off that ran in the October 1900 Black Cat. Even Bleiler nods. Somehow he overlooked another mechanical man in The Black Cat. For the first time in over one hundred years, for your delectation, a robot story seemingly nobody alive except me has ever read. Here it is in its entirety. The Wonderful Adventures of ‘Mr. Jones,’ the Electric Man. “It’s as near a perfect bit of work as you will find on this earth, murmured Professor Edicombe ecstatically as he gazed on his handiwork. Jem Gannett scratched his head, bewildered. “There ain’t no manner of doubt there’s money in it – if what you say is right,” he said in somewhat awed tones. “It cannot help doing that, so far as human ingenuity can arrange,” said the Professor, casting an approving glance over the form that stood leaning against the wall. Jem’s eyes shone. The more he considered the situation the more enthusiastic he became. “Of course if the bloomin’ clockwork goes wrong we stand a good chance of bein’ found out. I won’t say as we shouldn’t be sent to quod for false pretences,” he observed thoughtfully. Again Jem Gannett scratched his head. In his early life he had been a famous athlete; in later years adipose tissue and short wind had turned him into a trainer, and his imagination ran riot as he contemplated possibilities with the electric man. Mr. Gannett, regarding the affair as uncanny, stepped back a pace as the Professor approached the electric man. “Mr. Jones” was a triumph of scientific skill. Internally and even on the outside he looked marvelously realistic. The face was made of some composition, and although the expression never altered, it would have deceived anyone. The body was dressed in a vest and “shorts,” and the wiry-looking legs, which were the chief part of the apparatus, had taken up two years of the Professor’s time before he was perfectly satisfied with them. The electric man was taken, arm in arm with the Professor, to the front of the house, and then put through his paces. There was nothing about the walk of Mr. Jones to suggest irregularities. “I s’pose he can go round a circular track?” queried Jem Gannett anxiously. The automaton began to walk round and round the lawn, with a stately tread, his head thrown a little backwards, and his arms swinging naturally. The Professor pulled one of the levers over slightly, and Mr. Jones broke into a quick trot. Another twist of the lever, and Mr. Jones began to run as fast as any human being ever covered the track on foot. His style was faultless, and he was as cool as a cucumber. “About ten hours,” said the maker of Mr. Jones contentedly. There was silence for a while as Mr. Jones described small circles, and then Jem Gannett scratched his head again in perplexity. Mr. Gannett, feeling the thing was eerie in the extreme, had some diffidence in approaching the runner as he passed. It seemed almost impossible to believe that the figure was not a real, living being. He put his hand out and touched Mr. Jones lightly on the chest, half expecting the automaton to turn round angrily and ask him what he meant by taking liberties. Instead, Mr. Jones threw up his hands in a most life-like fashion, lurched a step or two forward, exactly like an athlete who has spent his last ounce of strength, and fell down. The only movement left was a heaving of the chest. Round eyed, and a trifle pale with excitement, Mr. Gannett looked down at the prostrate form. The Professor made a comical face. Mr. Jones had arisen, with assistance, and as he strolled across the lawn he appeared as fresh as ever. “Let’s enter him for the mile race at the Puddimore sports next week, Professor. Thus was Mr. William Jones, the deaf and dumb athlete, launched upon his career. His trainer spent most of his time during the next few days looking up forthcoming athletic meetings, both at home and abroad. “It’s like backing a dead cert, every time,” he remarked with joy to the Professor. After all, his enthusiasm was not to be wondered at for Mr. Gannett was the first trainer, in all time, who could send his man to the post, knowing with absolute certainty that he could not be beaten. The two conspirators got up early every morning and, in the dim twilight, gave Mr. Jones a good five furlongs sprint, so that they could be sure of handling wins neatly in public. “ ‘E’s a marvel,” was the verdict of Mr. Gannett, “and ‘e doesn’t even need rubbing down after the race,” he added with a chuckle. The Puddimore sports were the chief athletic event of the year in the district, and there was always a big crowd there. The Professor thought Mr. Jones should go down in a cab, but the trainer, not being quite sure how the mechanical man would get out of the vehicle, insisted that they should walk down to the ground. Mr. Jones, accordingly, strolled along in a heavy overcoat, one of the trainer’s arms resting lovingly on his. The mile race was the event of the day. Two of the competitors were well known in the athletic world, and it was generally considered that the result would rest between them, until it leaked out that Jem Gannett was backing his own man. Jem was regarded as a wily individual, and the experts began to wonder whether he was going to spring a surprise on them with his mysterious Mr. Jones. The odds were shortened accordingly. By the time the six starters were lined up, Mr. Gannett was in a state of nervous prostration. He had hit the biggest thing of his life, but he felt terribly anxious. Something of his anxiety spread to the usually placid mind of Professor Edicombe. During all the years of his patient work on Mr. Jones he had merely regarded his creation in a scientific light. It was only when he stood at his automaton’s side, awaiting the crack of the pistol, that he realized the full possibilities in front of him. For the first time in his life the Professor grew nervous. His hand was unsteady even before the pistol went off, and at the critical moment he pulled the lever a couple of notches too far. Neither Puddimore nor any other place had ever seen a race start in such an amazing way. Mr. William Jones burst away at the rate of over thirty miles an hour! For a full ten seconds the vast crowd held its breath, spell-bound, and then a mighty roar went up. In a few moments Mr. Jones had a clear lead of fifteen to twenty yards. The world had never seen such a runner. He was tearing round the track as fast as a horse could gallop. “The man must be mad. He can’t keep up that pace for a mile,” exclaimed the mayor of Puddimore who had risen from his seat in sheer astonishment. But the mayor was mistaken, for once in his life. Mr. William Jones tore along like a greyhound, his step never varying. There were two laps to the mile, but the deaf mute had completed the first lap before the rest of the field had got half way round. The crowd yelled in frenzy. There were only two people in that vast concourse who felt they did not quite know what was going to happen. One was Professor Edicombe and the other was Mr. Jem Gannett. An ear-splitting shout showed that the astonishing runner had won the mile, but the most extraordinary part of the race was that he did not stop at the tape. With his head thrown back, and displaying no sign whatever of fatigue, he shot past and started on his third lap. Mr. Gannett tried to tap him on the chest, but the automaton was going at such a rate that he missed him. “Let him go,” shouted hundreds of voices. A man who could run a mile at that speed and then evince no desire to stop was too good a sight to lose. “I beg of you, Mr. Gannett, think what we had better do,” said the Professor. The trainer’s brows were puckered. But Mr. Gannett’s luck was out. Five times Mr. Jones tore round the course, his speed increasing if anything, and every man in the grounds was hoarse with shouting. At the end of the fifth lap Mr. Gannett was waiting for the runner with a grim face. The affair was getting serious. People were saying that the man would drop dead, and that he ought to be stopped. The little trainer stood as firm as a rock and caught Mr. Jones squarely on the chest with his hand. It was in vain, but the impact was so great that Jem turned a somersault. The Professor ruefully helped him to his feet. “His blessed stoppin’ works have gorn wrong,” gasped the trainer, and then he stood still with his eyes bulging out of his head. The runner had turned off the circle and was now making a bee-line for the cliffs. The sports were forgotten, and a vast multitude left the stands to flock after the vanishing figure. Mr. Gannett and the Professor were sitting together some hours afterwards. BEATS ALL RECORDS: TRAGIC SEQUEL. Puddimore witnessed the eighth wonder of the world to-day. William Jones, a runner hitherto unknown to fame, won the mile race in a marvelous fashion, covering the distance at the rate of 33 miles an hour; and then he continued his astonishing performance by going round and round the track at the same pace. It had never been conceived that any human being could run at anything like that speed. There is every reason to believe, however, that William Jones achieved the feat in a fit of madness. His trainer tried to stop him several times, and after the fifth lap the two had a terrific fight. With Herculean force Jones hurled Mr. Gannett half a dozen yards and made a frantic dash for the open country. It was only too clear by then that the unfortunate athlete had become demented. An enormous crowd ran after him, but he soon out-distanced the fastest runners and headed straight for the cliffs. Only one man was present at the terrible scene which ended the historic run. He was a farm labourer who happened to be standing there. “I saw the runner coming at me,” he states, “like an express train. He seemed fairly to fly over the ground. I shouted to him to mind the cliff, but he took no notice. There was madness in his eyes as he rushed past, quite close to me. At the place where William Jones committed this rash act there is a strong current, and it is feared his body would soon be carried miles out to sea. There was something suspiciously like tears in the eyes of the Professor as he laid the paper down. “To think that the product of ten years’ labour should end itself by committing suicide!” he said sadly. “P’raps it’s as well for me and you, Professor, that there ain’t no chance of the body bein’ found,” commented Mr. Gannett. And then the pair lapsed into moody silence. Every robot story from that era has the same ending, the mechanical man – or woman – unstoppably amok, a cogent comment on modern technological “advances.” Robots wouldn’t be menaces until after World War I. The elimination of the evidence is another common gimmick. 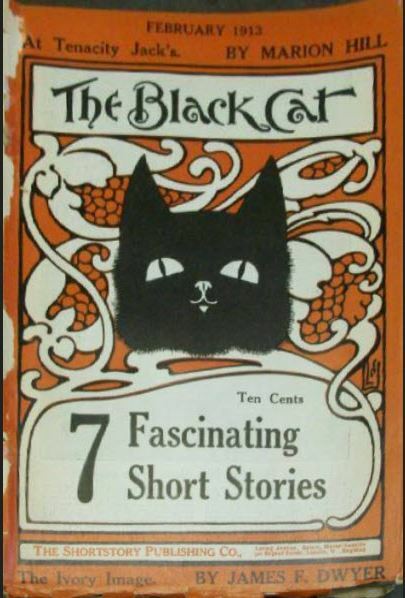 Sadly, The Black Cat did not illustrate its stories and neither did the Sheffield Weekly Telegraph. An artist’s conception of Mr. Jones whizzing past the other runners would be a true relic. Try watching Chariots of Fire on fast-forward. It’ll be the closest we’ll ever get. Steve Carper writes for The Digest Enthusiast; his story “Pity the Poor Dybbuk” appeared in Black Gate 2. His website is flyingcarsandfoodpills.com. His last article for us was Two, Count ‘Em, Two Nazi Robot T-Rexes.